There are many imitators out there, but only one Graston. Don’t let the scary tools fool you: the Graston Technique works. 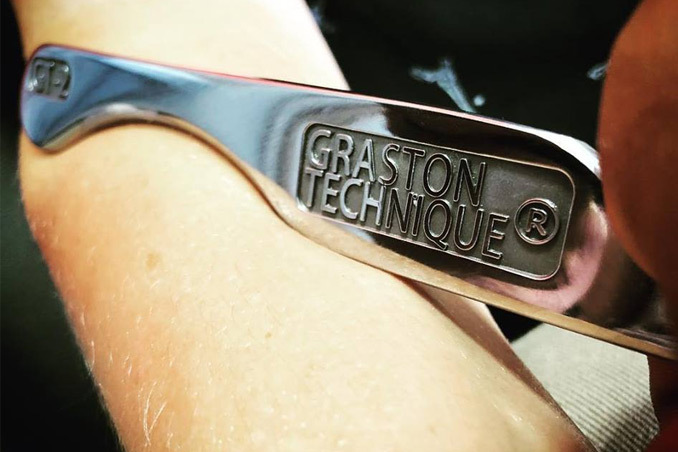 Graston is a patented form of manual therapy that uses stainless steel tools to perform muscle mobilizations. It is a kind of soft tissue mobilization used mainly by chiropractors, osteopathic physicians, physical therapists/physiotherapists, occupational therapists, and some licensed Canadian massage therapists. You can think of the Graston Technique as a deeper, more intense version of manual therapy. Specially trained clinicians use specially designed Graston tools in two ways. First, to locate muscle knots or restrictions. They do this by running the tools over your skin to feel for fibrous or scar tissue that may be causing you pain or restricting your movement. Second, they use the tools to break up that tissue to restore mobility and function.